Fancy exploring the slopes in your favourite ski resort in a totally new way? Whether you’re a skier or a newcomer to the slopes, snowbiking is fun for everyone. If you regularly ride a bike or motorbike in the summer, you’ll also be able to speed quickly across the slopes by snowbike, because snowbiking is very easy to learn. You’re guaranteed to become a real snowbiking pro in two hours at the most. Steering is completely intuitive on a snowbike. Just look in the direction you want to go and you’re already turning into a slight curve. ... that snowbiking is healthy? 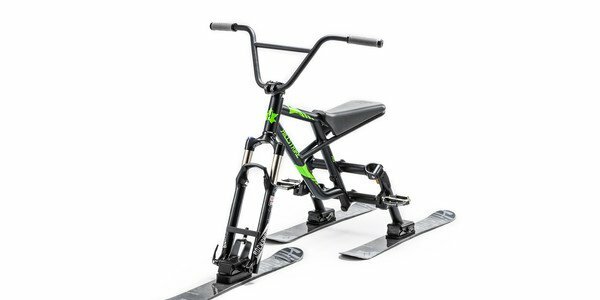 Anyone riding a snowbike across the slopes is mobilising their spine and working out their stomach and buttock muscles at the same time. Working out has never been so much fun! By the way: Similar to normal cycling, snowbiking is also particularly suitable for people with knee problems as there is less strain on the knees sitting on the bike - a great alternative to skiing and snowboarding!